I was one of the bridesmaids of my good friend’s wedding. It was a lovely party all around. Every couple has their own how-we-met story, but we were talking about what really brought them together. I would like to share an interesting side of the love story related to Thai believe. I believe many of you have been to Bangkok and have heard of the Central World shopping mall in Chitlom skytrain station. 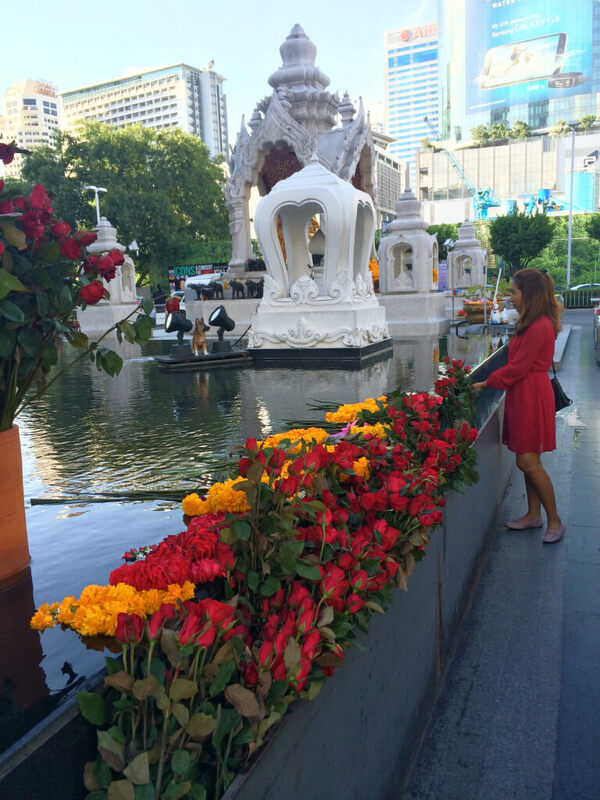 When talking about Central World one of the things Thai people will think of is the Trimurti Shrine which is known as Bangkok’s shrine of love. Everyone in the wedding knows the story that my friend’s sister introduced my friend Sai to her groom so they started dating, but only us bridesmaids know that before she met her husband-to be, Sai went to worshiped Trimurti shrine (ศาลพระตรีมูรติ) and asked to meet her soulmate within three months. The god answered her wish and Sai met her boyfriend exactly three months after that. And today they are husband and wife. At the dining table in the wedding my friends and I were talking about how sacred the god of love really is. Surprisingly, all of us know someone who has worshiped the shrine and then tie the knot soon afterwards. A good friend of mine who is now married to a Korean guy, and they have one adorable son together. She also told me that she worshiped the Trimurti god a few weeks before she met her husband in the Bangkok MRT. My friend’s wedding who is married to a Korean guy. The boyfriend of my friend who was also a bridesmaid in this wedding told us that before they met, he went to make a wish from the shrine. Now they have been married for a few years and my friend just gave birth to a beautiful son. So if you are still single and would like to welcome true love to your life, here is what you do. Sit in front of the shrine and say the prayer which is written on a stone below the shrine. 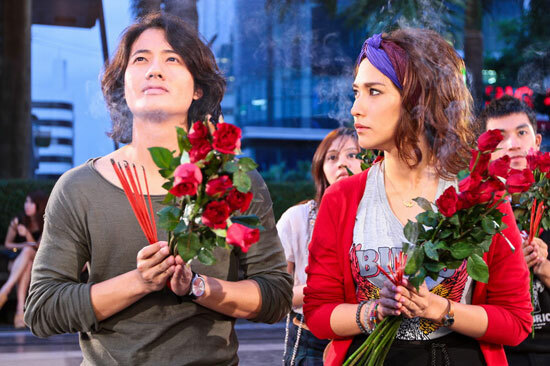 Then offer the roses to the god and put the candle and incense sticks in the pot. If your wishes come true you have to present the gift to the god. People usually give coconut, milk, sugar cane juice and sweets. 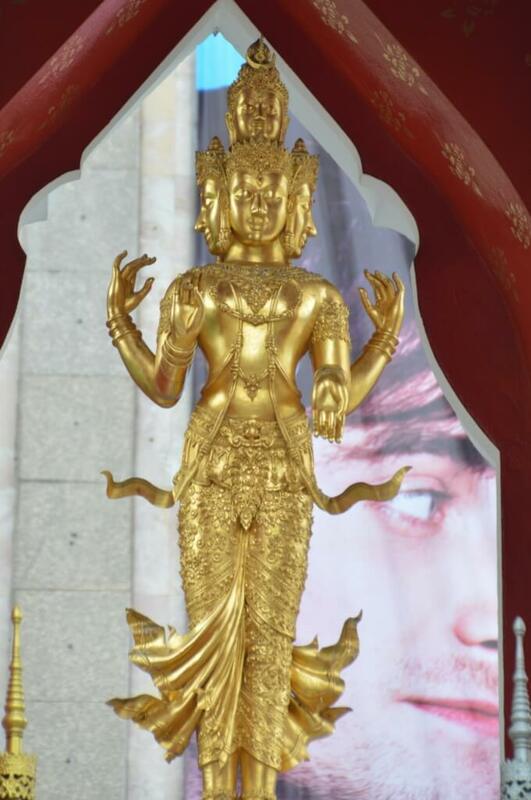 Many believers claim Trimurti god is especially successful in matching foreign mates with Thai lovers. In Hinduism, Trimurti represents the three aspects of God: Brahma (the Source/Creator), Vishnu (the Preserver) and Shiva (the Transformer or Destroyer). 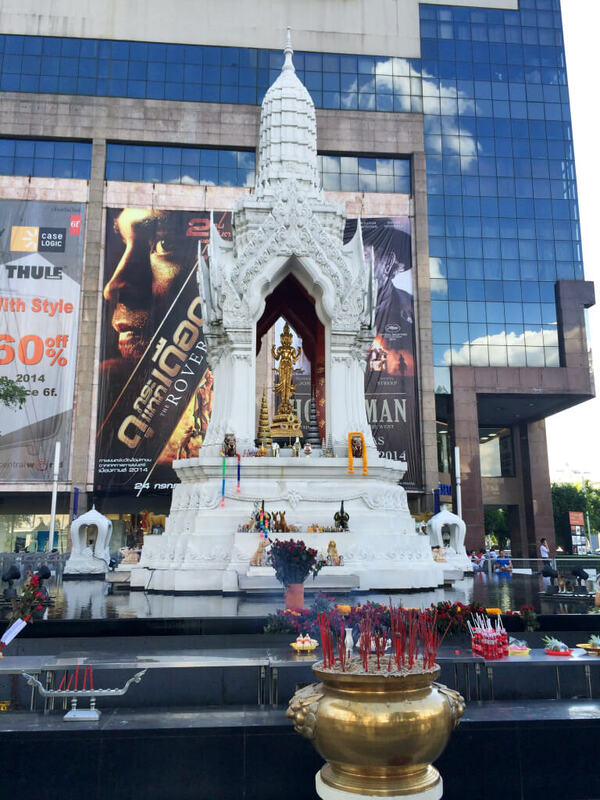 However, I have read that the Trimutri situated in front of the Central World is actually five-headed Shiva but local people call the statue Trimurti. Hi Mod, not sure if the previous comment was sent out. I am from Singapore, my mum is going Bangkok next week but I’m not. Can she be the one praying for us instead? I would like to reconcile with my ex-boyfriend. All I’d like to ask for is one chance from him, to be with him happily. How can we go about it? How many candles or roses or other items should my mum be getting? How should we be praying and reciting? Please help me out. I would appreciate it very much. Thank you! Hi! I am sorry I didn’t see your comment earlier. I hope things between you and your boyfriend are good now. Best wishes! I would like to ask if you could write the prayers of that is on the stone here in alphabetical order so that we can read it from there? I am afraid I can’t write the prayers for you now because I don’t remember it, and neither Pear nor I are in Bangkok right now. If you go to pray you should use one candle. I’m a bit confuse about the amount of candles that I should use. Because I saw many pictures in the internet whereby everyone uses two candles. Just to make sure I’m not wrong… I have a guy that I like and we are not together yet, we are just friends now. But I have feelings for him and would like to grow into a serious relationship with him, I’m suppose to use one candle right? Also Mod, I saw Phra Trimurti’s katha on the internet. But I’m not sure if it’s the right one as the one you read previously. I have paste it below, could you have a look if it’s the correct one? Today I come to worship and deeply appreciate your kindness and blessings toward all beings. I sincerely pray for [speaking your wishes]. Thank you so so much Mod! Dear May, I am sorry for my late reply. Yes, the Katha is the right one. Single person wishing to have a partner should use only one candle. Thank you, Kruu Mod! I really enjoy every information on your website. After reading a post or watching a video I fall in love to Thailand more and more. I sure will visite this beautiful country once again, and I hope also Bangkock and some other places you tell us about! Thank you for your work! good luck! So excited to learn this post. However, I’m a foreigner and can not read Thai language, how can I say the prayer which is written on a stone as you wrote? Sawatdii ka Thuyen, it is a good question. I was thinking about the same thing after posting the article. I am afraid I don’t know how to help with this matter. I don’t know if it is ok if you only ask for wishes in English without the prayer. I have red your post ready it is interesting story so, one day if I go to visit Thailand I will go there . And please you help guide me ! Thanks for the advice. I’ll visit the shrine next time I’m in Thailand! Why dont we go together and you show me how to pray the shrine of love? 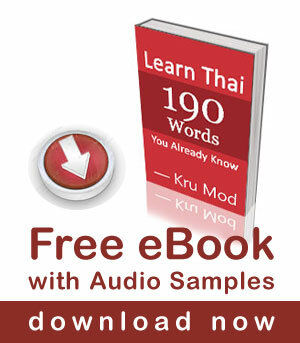 Thanks Kru Mod for you wonderful insights on the Thai culture. Since I am a farang, I will make sure to bring my Thai waanjai to the shrine the next time I am there (in 4 weeks from now). Why so many number 9 (NEIN means NO)? Best time 9:30 am and 9:30 pm. Thai people believe that number 9 is a lucky number. The pronunciation of “9” in Thai is เก้า /gâao/ which sounds the same as the word ก้าว /gâao/ that means ‘to go forward, progress, advance’. Thank you very much for your very useful information. I always pass it by, but never know it was shrine of love. I thought some shrine for commerce as it is so near to Central World.